Zappia was a three-year starter at Mater Dei High School. She earned first AAA rating at the age of 15, and played for Elite Beach Volleyball Club Manhattan Beach. 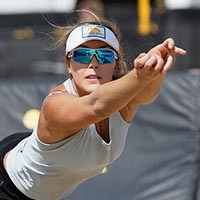 Zappia began competing for UCLA's sand volleyball program in the spring of 2015. She has an older brother, John, who is a middle blocker for UCLA. Zappia has a black belt in taekwondo.